St. Patrick's Day is this Wednesday, and a lot of people will be putting out the same boring corned beef and boiled cabbage on their tables. This year, why not put out something that people will actually enjoy? 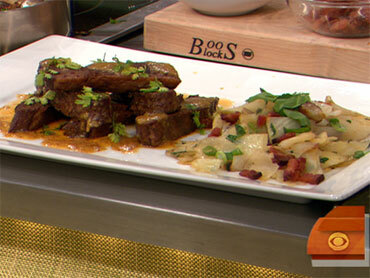 "Early Show" resident chef Bobby Flay prepared his new twist on the classic Irish dish, corned beef and cabbage. The first change Bobby makes is with the preparation of the corned beef. To infuse more flavor, he first cooks off some bacon then sears the beef in the bacon fat until a nice crust forms. Next, he combines Dijon and whole grain mustards, horseradish and honey for a dipping sauce with a little kick. For the cabbage, he roasts shallots in the oven with a little salt, pepper and sugar. Then, he tosses the caramelized shallots with the prepared cabbage and tops with bacon. To serve, Bobby toasts rye bread and tops with a good quality blue cheese. Put everything together and you have a corned beef and cabbage recipe you'll want to make more than once a year! Rub beef with spice rub. Set aside. Heat 1 tablespoon of the oil in a large sauté pan over medium heat. Add bacon and cook until golden brown, remove with a slotted spoon to a plate lined with paper towels and reserve for the cabbage. Sear the beef in the bacon fat until a crust forms, turn over and continue cooking until golden brown. Remove, let rest and thinly slice. Whisk together mustards, honey and horseradish. Serve beef with sauce on side and garnish with chervil. Preheat oven to 350°F. Place shallots on a sheet pan, toss with a few tablespoons of oil and sugar and season with salt and pepper. Roast in the oven, turn occasionally, until golden brown and caramelized. Toss with cabbage to heat through. Transfer to a platter, top with reserved bacon. Place bread on baking sheet. Toast in oven until crisp on both sides. Top with some of the blue cheese and bake until slightly melted. Serve bread with spiced rub corned beef and cabbage.